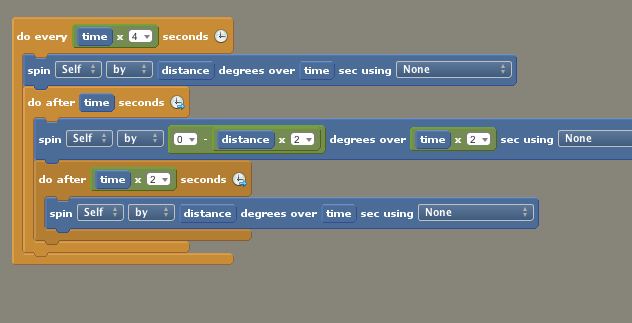 Trying to program the motion of a Wibble Wobble. (Actually trying to make ice floating motion). But I cannot find anything on it and don't really know where to begin something like this. Does anybody have any suggestions? So I thought about this all day at work today... Only thing I could think was to have the center of gravity move in an elliptical motion, having it change directions only once it hits a "tipping point". With stencyl, I do not believe this approach will work. I am going to experiment with "turn" of the actor while also throwing in a small up and down vertically motion. Ill post the results if it works out. Could you not achieve this with the tweening slide block? There's options for different kinds of movement. Or do you need the physics? Are they platforms, or just for effect? I will also think about this! Would you need to be able to have the ice be interactive with the player? Ie player runs across the top of the floating ice and it tilts depending on where the weight of the player is? Hey guys, thanks for the reply's. It is just for animation purposes. I have it sorta working how I want it. I cant seem to get that pause in the middle out yet, but ill keep trying. You can check it out below. Also... after about 10 mins.. the penguin gets kinda sideways to the right... I am not sure why. I feel like the code should keep it centered. Here is the code I am using.